[via engadget] Kudos where it's due: not many design houses use tanks in their illustrations of a new road safety concept. Transparentius, as with most good ideas, is remarkably simple -- you jack a camera onto the front of a truck, or lorry as they're known in some places, and then project that image onto the back of your hulking transporter. 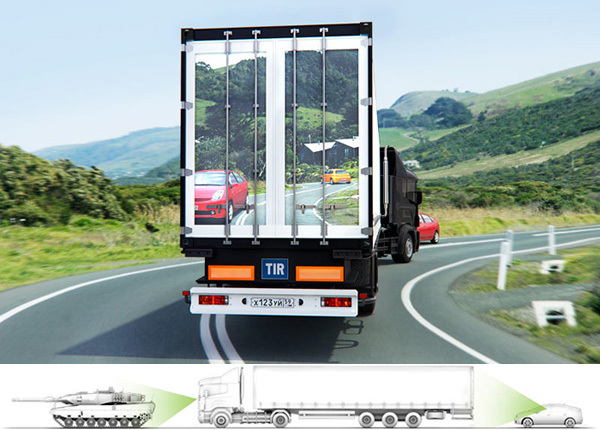 The effect of this is to render the truck figuratively transparent for the driver behind, who is enriched with a lot more information about what lies on the road ahead. No word on how the rear projection is achieved or how sunlight glare is overcome, but knowing Art Lebedev, you can bet both challenges are solved in the most unaffordable fashion possible. Anyhow, now that you've got the idea, we're throwing this one over to you dear mod-loving friends -- can you build this without remortgaging the house?